Once upon a time there was a man who wanted to catch fish. He read several books about how to fish. 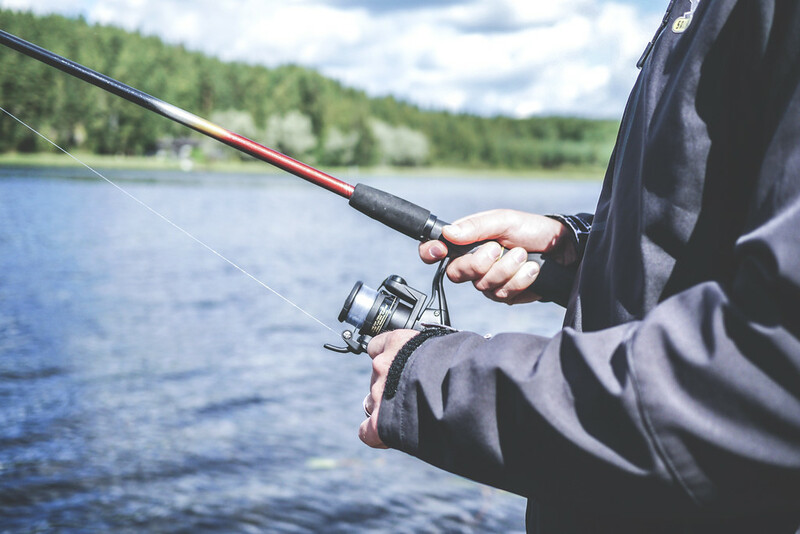 He went to the sporting goods store and bought a fishing pole, tackle box and some lures. While he was there he asked for advice from the sales people. They gave him lots of good advice and he wrote some of it down and bought some additional lures that they recommended. When he got home he got out a map and planned his fishing trips for the year. He talked to some friends who were fishermen and asked them for advice. They had lots of good things for him to try. He also looked on the Internet and Googled how to catch fish. He couldn't believe how much good information there was out there about fishing. He went to a pond by his house and practiced casting his lure, using one of the lures in this tackle box. He didn't catch anything, but it was good practice. He watched some reality fishing shows on cable TV. They had lots of great advice and appeared to catch a lot of fish. As time went on, he attended the local Boat, Sport and Travel show and talked to a number of fishing experts that were present at the show. One time he drove out to a nearby lake and talked to some of the fishermen who were launching and retrieving their boats. He added their advice to his plans of what he was going to do when he went fishing, based on their expert advice. He spent a lot of time thinking about how he was going to catch fish and getting ready to go fishing. He had lots of plans, and lures, and places to go and expert advice. But so far he was discouraged because he wasn't catching any fish. He finally decided that it was time that he actually go fishing. He drove to the lake, launched his boat, drove out in the middle of the lake and started casting one of his lures. The tried it for about an hour, but didn't catch anything. He remembered some of the experts had talked about using different lures. So he dug in his tackle box and got out another lure and tried it for another hour. Still he didn't catch any fish, and by now he was hot, tired, thirsty and hungry. He decided there were no fish in this lake and went home. Later that week, he went to the sporting goods store and asked them about his experience. He wondered if they knew some better lakes to fish in? One of the fishing experts told him that he had been to the very same lake that the man had tried and caught a lot of fish there. The man couldn't believe it. They must have been lying to him. Surely he would have caught some fish if they were there. He decided that fishing was not for him. Obviously he didn't have the knack for it and all this advice he had received over time was really worthless information. 1) Fish were the fish are. They are not everywhere in the lake/river/stream. 2) Use a variety of bait/lures based on what they are eating. 3) Pay attention to the weather - the fish tend to bite when the barometer drops - when is the best time to market? 5) Don't scare the fish away - the big fish are especially wary and tend to hide - how can you entice them out of hiding? 6) Don't over look fishing at the dock (your neighborhood) - sometimes the fish are hiding underneath. 8) Advice from the experts is useless unless it's followed. 9) Reality TV ain't real - they fish for hours to record a 30 minute fishing show. All is not how it seems. 11)The more times you cast your lure in prospective places the more fish you will catch. You can’t control the fish, but you can control where you fish and how many times you throw out your lure. Jim Jordan is the Broker/Owner of Realty World Indy, with 20+ years of sales and marketing experience.